Who doesn’t love a good family recipe that has been passed down from generation to generation? Not only do you get that warm fuzzy feeling when you smell the familiar scent of your grandma’s famous casserole but you also feel connected to your family line, the one that has passed down recipe after recipe, from one generation to the next. I wouldn’t know a thing about this though. We don’t really have family recipes. While my dad does have his grandmother’s handwritten recipe notes, we really don’t have *A* recipe that has been passed down with a knowing smile and a lots of love. I need to change that! It is never too late to start a tradition. At least I don’t think so. Those recipes that have been handed down in your family had to start somewhere, right? So today, I am sharing the recipe that I would like to pass down to Tiny who perhaps will have children of her own to pass it along to. This crispy duck confit recipe is one of my favorites. It is a staple in my dinner arsenal and is always well received. It isn’t fancy. It isn’t complicated. But it is so good! You only need a few simple ingredients. I know duck can be a bit difficult to source but it is worth the effort. I try to stock up when I find some. They method of cooking is what really makes this recipe absolute perfection. While duck can be a bit tough, this duck confit comes out super moist…almost fall off the bone. 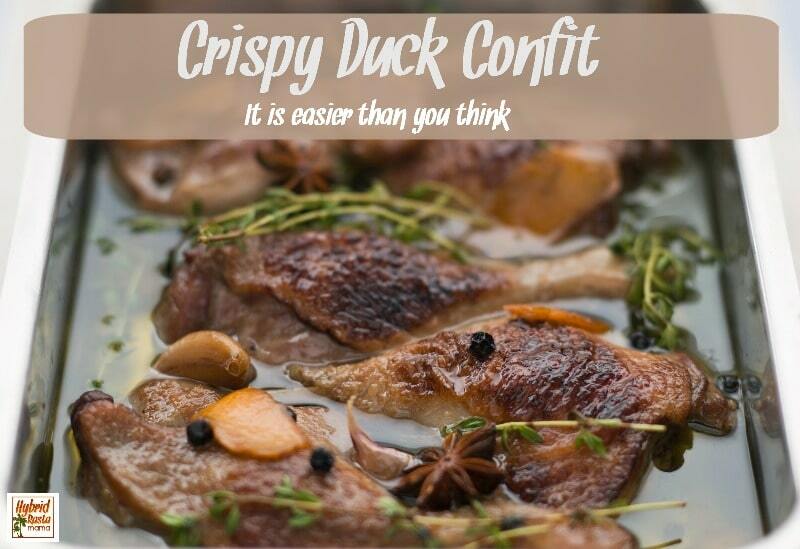 Are you ready to step outside the box and try your hand at crispy duck confit? 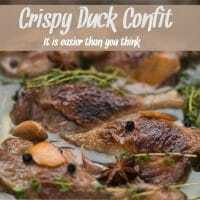 While duck isn't a typical staple dish for many, once you try this cripsy duck confit you will quickly add it to your dinner rotation. So moist, so good! Wash and pat the duck legs dry. Salt the heck out of the duck legs. Seriously. Use more than you think you should. Let the duck legs rest at room temperature for at least 30 minutes. One hour is better. Don’t worry…they will be fine. You need to let them sweat! Put a thin layer of duck fat (if you have it), butter, bacon grease, or coconut oil in the bottom of a small glass baking dish or dutch oven. Put the duck legs in skin side up, touching each other (not overlapping) without extra room in the baking dish. Put the baking dish in the over then turn it on to 285 degrees F (and if your oven does not go that low, 300 degrees is fine). And yes – no preheating. After 90 minutes check on your duck legs. Somewhere between the 90 minute and 2 hour mark, the duck legs will be partially submerged in delicious melted fat and the skin will be in the mid-stage of crisping up. It is at this point that you want to crank up the temperature to 375 degrees. Check on the duck in 15 minutes. You are looking for a golden brown tone to the skin. If it is done, awesome! Take it out of the oven. If not, keep checking on it every 5 minutes. You do not want burnt duck legs. After you remove the duck from the oven, let it cool for 10-15 minutes. The dive in! The awesome thing about this recipe is that the duck meat, when cooked this way, will last up to 14 days in the fridge! Yay! You can also save the duck fat and use it for cooking or even for body lotion. Seriously. It keeps for a long time in the fridge! « Can You Overdose On Coconut Oil? I’m fairly sure that we have never tried duck. I vow to make this recipe this year!! I love the idea of choosing a recipe to pass down! That’s a great legacy to leave. Sam is going to love this recipe, because he adores duck, and I don’t think he’s ever tried to make it for himself. My husband has saved rendered turkey fat to do turkey confit this way. Thanks for the extra tips! I’ve never tried duck, but this looks really do-able. Why is it so scary to try something new? I love how you have suggestions for what to do with the leftover fat. I want to do more of those things. Oh MY! This looks yummy!! 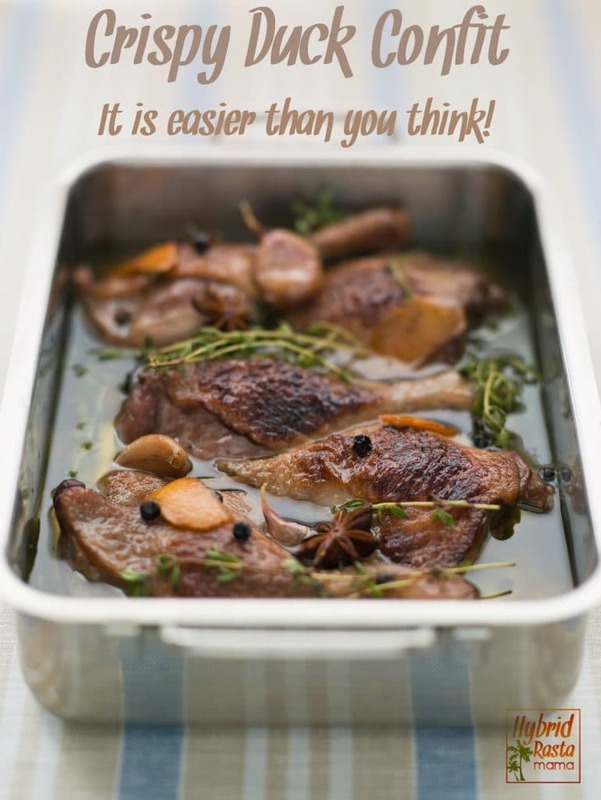 I’ve been looking for a good confit recipe to try, and this fits the bill. Thanks!